Interview with Erik Solheim and myself at the 14 January Toronto launch of my new book. 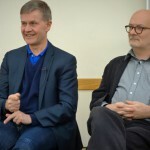 The Sri Lankan civil war holds many a lesson for the island-nation’s diaspora community in Canada and the world in general, according to Erik Solheim, former Norwegian Minister for International Development and for the Environment. Solheim’s name is synonymous with peacemaking in Sri Lanka. “My biggest sorrow was that thousands of Tamils died unnecessarily due to lack of vision from both the Sinhala and Tamil leadership,” he said in Toronto this week, lamenting the futility of the civil war. The country having gained a measure of calm in recent years, Solheim called on the diaspora community to participate in the South Asian nation’s economy and thereby help heal the ethnic fault line. It has long been suspected that the country’s Tamil diaspora worldwide, including its largest presence here in Canada, helped fuel the civil war through remittances and arms shipments. Solheim was in Canada this week for the launch of To End a Civil War, a book by Mark Salter on Norway’s peace efforts to end the island nation’s bitter fight. He referred to the formation of an air force by the LTTE, the first by a non-state player that was made possible by diaspora contributions. “While it was an impressive achievement, it made absolutely no impact on the final outcome of the war.” Currently the Chairperson of the Development Assistance Committee for the Organization for Economic Co-operation and Development (OECD), Solheim said apart from political initiatives, a lasting solution to the ethnic fault line can be achieved through rapid economic growth. The peacemaker suggested that a bipartisan consensus between Sri Lanka’s major political parties would further help the healing. The lack of such a consensus between the historically-opposed Sinhala political parties, the United National Party (UNP) and the Sri Lanka Freedom Party (SLFP), had played a role in prolonging the civil war. He hoped the current bipartisan administration of President Maithripala Sirisena (SLFP) and Prime Minister Ranil Wickremesinghe (UNP) can see through the process of rewriting the country’s constitution and move ahead on transitional justice. Author Mark Salter said the importance of achieving bipartisan consensus is evident elsewhere. “Peace in Northern Ireland is a prime example of buy-in by all factions involved in a conflict.” Salter said the inability of the then Wickremesinghe government to explain the peace dividend in simple terms to the majority Sinhalese Buddhist population was a key factor in the failure of the Sri Lankan peace process. Buddhists account for over 70 per cent of Sri Lanka’s 21 million people. His Norwegian team had been in constant touch with India and the U.S., the two big international players, throughout the peace process. “No one nation can lead on all fronts in international affairs today,” Solheim told New Canadian Media when asked for his reaction to the new Canadian government’s global aspirations. “You must define a few areas of interest. But most importantly the desire to help must come from the heart.” Expressing delight over Prime Minister Justin Trudeau’s “We’re back” pronouncements, he was planning to meet Foreign Affairs Minister Stéphane Dion in Ottawa during his trip to the capital for the launch of Salter’s book. The Toronto launch was organized by Sri Lankans Without Borders and was moderated by Amaranth Amarasingam of Dalhousie University.